NASA has installed atop United Launch Alliance’s Delta 2 rocket a Northrop Grumman-built spacecraft designed to track changes in the Earth’s ground and sea ice, Spaceflight Now reported Tuesday. The Ice, Cloud and land Elevation Satellite 2 is slated to take off Sept. 15 from Vandenberg Air Force Base in California as part of the final flight of the Delta 2 rocket that entered service in 1989. Ground crews started installation work on the ICESat 2’s payload fairing after lowering the satellite aboard the rocket’s second stage early Sunday. 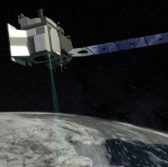 ICESat 2 will lift off with the Advanced Topographic Laser Altimeter System payload designed to collect data about forest canopies and ice sheets by measuring the speed of laser beams. ATLAS works like a stopwatch and “has the ability to time tag a single photon to billionth of a second accuracy,” said Donya Douglas-Bradshaw, ATLAS instrument manager at NASA’s Goddard Space Flight Center. “This precision allows the instrument to detect annual changes in ice elevation on the order of half of a centimeter (0.2 inches),” Douglas-Bradshaw added.